U14B NJ STALLIONS 03 INTER Boys Are Jefferson Cup Finalists! Ranked #10 in NJ! Congratulations to the U14B NJ Stallions 03 Inter EDP team for making it to the Finals at this year's Jefferson Cup Tournament. Over four tough matches, the NJ Stallions Boys played against very strong teams from North Carolina, Massachussetts, Pennsylvania and Maryland. They defeated CASL White North by a score of 3-2, and then in Game 2 outlasted t a top 10 Massachussets team, FC Stars NPL, with the NJ Stallions boys winning 1-0. The third game against the Phiiladelphia Ukranian Nationals 03 saw the NJ Stallions score 4 goals. The final came against the Salibury United team from MD, where the NJ Stallions eventually lost 1-2. 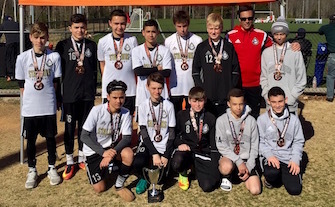 Overall the tournament was a big step forward for the U14B NJ Stallions 03 Inter team. With the Finalist showing the U14B NJ Stallions 03 Inter EDP team is now ranked #10 in New Jersey!